Samsung has been focusing on its innovative edge display technology for the last few years to make some handsome-looking phones, but it may soon take things to the next level with foldable tech. Rumors of the Samsung foldable phone – codenamed Project Valley – have been building for a few years, and the latest leak suggests it'll be ready for a release next year, under the name Galaxy X. A post on Chinese social networking site Weibo suggests the Samsung Galaxy X will feature a foldable 4K display to keep the resolution high when the device is bent – which would be a fantastic achievement if it really does have the ability to fully fold. 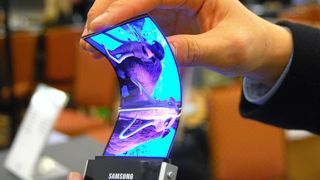 LG has released bendable phones – the G Flex and G Flex 2, in 2013 and 2014 respectively – but the Galaxy X is rumoured to be a much more complicated setup, which can fold up like a wallet. We can't properly view the source story – or even decipher what's written in the screengrabs over on SamMobile – and this, combined with the fact that we weren't expecting to see such a breakthrough in flexible screens this soon, suggests this could all be wild speculation rather than fact. The 'source' also goes on to make some rather dull claims that most of us could have predicted: there will be another four flagship Samsung phones in 2017. The source names the expected phones as the Galaxy S8, Galaxy S8 Edge, Galaxy Note 7 and the Galaxy Note 7 Edge. The first three names are rather obvious, given Samsung's been following this method of labelling its phone for years, but the latter would be an interesting move. We'd expect it to be called the S8 Edge+ to mimic the naming convention of last year that began with the S6 Edge+. Each phone will apparently feature a 2.5K resolution Super AMOLED display, with an RBG subpixel arrangement to continue Samsung's run of impressive screens. Whether we'll see that in a foldable phone next year remains to be seen.